Bookings being taken - Call Now!!! Are you looking to make an entrance? Then look no further than our Range Rover Sport limousine. This limo is the epitome of class. It has the looks, the power and the prestige to turn heads wherever it goes. It doesn't matter what event you are arranging, whether it is a school leaving prom, graduation ceremony or stag party, the Range Rover Sport will get you there in style. The limo has been finished in metallic silver, tinted windows and with 22” Vogue alloy wheels, making the Range Rover limousine a vehicle with serious street credibility. The interior of the limousine has been fitted with an array of luxury fixtures and fittings to make your limousine experience a pure joy. The Range Rover limousine can carry up to 16 passengers, in unparalleled style and comfort. 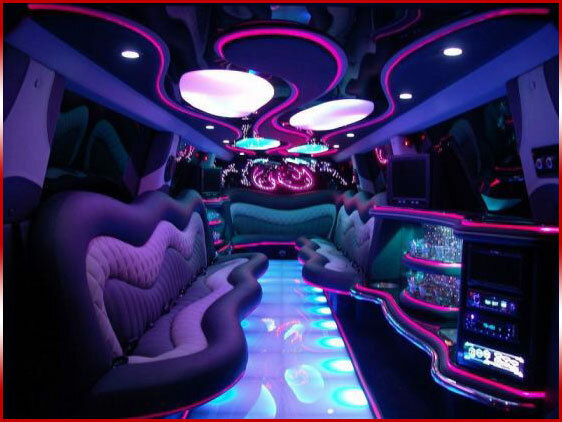 The limo has been designed with every comfort in mind and is guaranteed to make your day. We have installed comfortable leather J-seating, mini-bar, DVD player and 4 flat screen televisions. So why not sit back, relax, open up one of our free bottles of bubbly and allow us to make you feel like a movie star. If you are looking for a more entertaining journey, then feel free to bring your own selection of music. We are more than happy for you to use the Range Rovers 12 speaker sound system to blast out some of your favourite tunes and to get the party started. All of our vehicles are driven by our uniformed, professional chauffeurs, who will ensure you will have a night to remember. We will pick you up from a destination of your choice and then drive you to wherever you wish to go. We provide a nationwide, UK limo hire service, which is available 7 days a week, 24 hours a day and for any occasion you can think of. The Range Rover Sport Limo is true world class. The Range Rover Sport Limo is very sort after in the midlands on many different events like school prom in Derby, Weddings in Leicester, Nights out in Nottingham, Birthdays in Birmingham.